Libya: On Sunday, December 30, an explosion rocked a Coptic Christian church near the western city of Misrata, where U.S.-backed militias hold a major checkpoint. The explosion killed two people and wounded two others, all Egyptians. 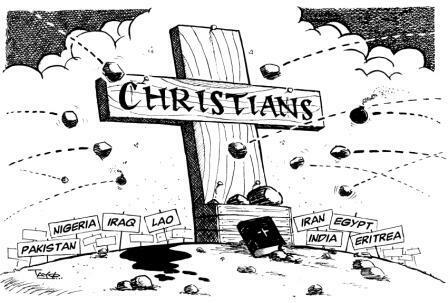 Nigeria: Christmas was another occasion for Muslims to slaughter church-attending Christians. First, in two separate attacks, Islamic gunmen shot and killed 12 Christian worshippers, including the pastor, who had gathered for Christmas Eve church services. In the words of a resident: “A group of gunmen came into the village at midnight and went straight to the church … they opened fire on them, killing the pastor and five worshippers. They then set fire to the church.” Six days later, on Sunday, December 30, Muslims attacked another church during service, slaughtering 15 more worshippers; several had their throats slit. At least four more churches were torched and 10 Christians murdered when, according to the report, “the Islamic group members went on rampage [sic] and burned 20 houses and a church in the area,” as well as three more churches, all to cries of “Allahu Akbar!” [“Allah is Greater!”]. After the Islamic invaders torched the churches, they used guns and machetes to slaughter their victims. Kyrgyzstan: After a young Muslim girl known as Almas converted to Christianity, her parents beat her “until she fell unconscious.” Next, because she refused to renounce Christ, her parents trapped her in a cold room for days and later scorched her face on the stove. Because she still refused to return to the Islamic fold, she was sent off to a sewing workshop and has since lost all contact with her Christian friends and associates. Pakistan: Birgitta Almby, a 70-year-old Bible school teacher from Sweden, was shot by two men in front of her home; she died soon after. She had served in Pakistan for 38 years. Police said they could not find the assassins and could not unearth a motive, although Christians close to her have no doubt “Islamic extremists” murdered the elderly woman: “Who else would want to murder someone as apolitical and harmless as Almby, who had dedicated her life to serving humanity?” That service may have included sharing the Gospel with Muslims, an act strictly forbidden in Islam. Sudan: Christians in the Nuba Mountains said they felt abandoned by the world, after the Sudanese air force killed at least 11 of them in bombings before and after Christmas: “We are surprised why the international community is so silent about the killing in South Kordofan [the region of repeated raids]” said one church leader, who requested anonymity. findalis, these updates are a massive work. Thank you so much!